Pompey the Great (106-48 B.C.) - It's quite remarkable that two such great military conquerors were alive at exactly the same time, with both having ambitions of occupying the same position; that of ruler of Rome. But in the end, it was Caesar who was just a little bit better. Six years older than Caesar, Pompey actually achieved success first and is the one with the epithet "Great" (Magnus in Latin) attached to his name. It was bestowed upon him at the age of only 25 by no less than Sulla himself after first distinguishing himself during the dictator's second march on Rome, and then cleaning out the remaining opposition by defeating forces loyal to Marius in Sicily and North Africa. But this was just the beginning. Pompey would go on to conquer more territory than any other Roman in history. He was driven by an insatiable desire for conquest and the power that went along with it, and accomplished his goals by following the precedent set by Marius of making his troops loyal to him instead of the state. Despite their loyalty, there was undoubtedly some fear of him as well. For after his campaign in Sicily in which he executed Gnaeus Papirius Carbo, a Marius supporter, his men dubbed him adulescens carnifex (the "adolescent butcher"). 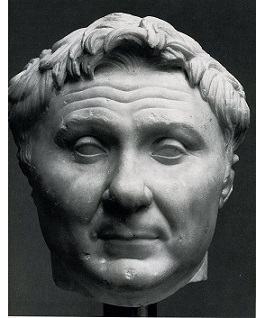 After the civil war spawned by Sulla and Marius ended, and Sulla retired to private life, Pompey became the most powerful man in Rome; a status he would hold for two decades until the rise of Caesar and the formation of the First Triumvirate in 60 B.C.. However, with the full restoration and strengthening of the Republic under Sulla's reforms, he couldn't just seize control on a whim. But what he could do is push the limits of his power, which he did. For example, when Marcus Lepidus (father of Marcus Lepidus of the Second Triumvirate) was elected consul in 78 B.C. and revolted against Rome in an attempt to seize power himself, Pompey led his army against Lepidus and squashed the revolt. That same year, the Senate voted to pursue the conquest of Hispania. Pompey requested to be proconsular imperium, which basically meant he would lead the campaign. The Senate, fearing his growing power and ambition, turned him down. Pompey simply refused to disband his army until the Senate relented, which it did. This move demonstrates Pompey's cunning. Whereas Lepidus revolted outright and was destroyed, Pompey acted much more subtlety and succeeded. It also reflected Pompey's shifting allegiance. He was an opitmate under Sulla and when someone else challenged the state, but where his own interests were concerned, he had no compunction in joining the populares. After a successful campaign in Hispania, Pompey returned to Italy in time to clean up the remnants of the Third Servile War (see Spartacus), and take credit for ending it. But his greatest accomplishments were yet to come. Rome's old foe in the east, Mithridates VI of Pontus was causing more trouble (see Mithridatic Wars). Initially, Lucius Lucinius Lucullus (let's call him LLL for short) was dispatched in 69 B.C. to deal with the problem. Despite being largely successful, Lucullus' authority was being undermined, most likely by Pompey himself, who was eager to take command of the war. In Rome, the Senate was eager to end it. The last thing it wanted to do is put Pompey in charge, but he was a force that could not be denied. His popularity among the people was soaring and he had powerful allies. Tribune Gaius Manilius proposed appointing Pompey commander of the eastern campaign. That alone would not have been enough; but Julius Caesar threw his support behind the proposal, and Marcus Tullius Cicero, to almost everyone's surprise, also backed it. The Senate agreed to Manilius' proposal and Pompey took control in 67. He achieved more than even he probably could have imagined. Not only did he defeat Mithridates and end the war, but he kept going. In 64, he deposed Antiochus XIII Asiaticus and annexed the powerful Seleucid kingdom into the Roman Republic. From there, he intervened in Judea's affairs. 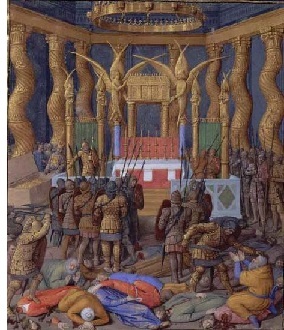 In 63, he laid siege to Jerusalem, and after three months, conquered it. Hyrcanus II was installed as the Hasmonean ruler and Judea maintained its independence (for the time being), but had essentially been reduced to client state of Rome. It was at this time that Pompey famously entered the Holy of Holies, the innermost sanctum of the Jewish temple, an act that was meant only for the Jewish priests. He had expected to see a statue of Jehovah, but there was none. In all, Pompey added four new provinces to the Republic and extended Rome's holdings into Asia for the first time. News of his conquests preceded his return home and he arrived back in Rome in 62 B.C. to great fanfare. However, he had been gone for five years and Julius Caesar's star had been rising in his absence. Caesar allied himself with Marcus Licinius Crassus, the richest man in Rome (probably in Roman history), and likely one of the richest men in all history. Crassus had good reason to dislike Pompey. Ten years earlier, he had been in charge of ending the slave rebellion under Spartacus, and although successful, some of Spartacus' men escaped his grasp and were defeated by Pompey upon his return from Hispania. In what should have been his greatest triumph, Crassus was forced to share the spotlight with Pompey. Now his money, and Caesar's charisma and military prowess provided a formidable counterweight to Pompey. This power struggle led to the formation of the First Triumvirate and a temporary alliance between Caesar and Pompey. In spite of its fame in history, this First Triumvirate had no official power whatsoever (unlike the second). In 59 B.C., Pompey married Caesar's daughter, Julia, strengthening further the ties between the two heavyweights. However, in 54, Julia died in childbirth, ending the familial connection between them. And in 53 B.C. Crassus was killed in Parthia (see Battle of Carrhae), bringing an end to the First Triumvirate. These two events made an eventual clash between Caesar and Pompey inevitable. The Second Roman Civil War began in 49 B.C. and led to Pompey's defeat and death in 48 (see Battle of Pharsalus). His entire career, Pompey the Great was being compared to Alexander the Great. After his defeat at the hands of Caesar, it was Caesar who was drawing the comparisons to Alexander.